Thanks for the sample Alessandro. This is what I see so far. This should have locations. I need to look into it some more. I might need so more sample. I'll let you know. The plug-in needed is "IFRecorder"
After some tweaking of code this is what comes up for those PDUs. I'm sure this is correct. But I could be wrong. Both PDUs here most likely contain type 5 elements going by UDT4 length but this doesn't contain location data. More IQ samples would be required to see if any SDS PDUs sent carry the location data. Ok made an error with displaying "VelocityDataRaw:4". 4 is the velocity data type. e.g. "Horizontal_velocity_and_vertical_velocity_with_uncertainty"
282.7km/h upwards (78m a second climb rate) with 5km/h forward direction, is that a helicopter? Seems quick. What do you think Alessandro. In linux with gnu radio and telive there isnt speed, decode only coordinates latitude and longitude. Thanks! if you need other sample i'm here! 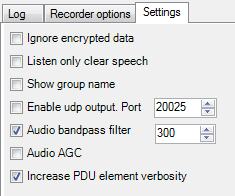 This guide will help create more focused IQ recordings @300Kbps wide rather than at 2.4Mbps. This has the benefit of smaller files or longer recordings. - This install requires copying 2 .DDL files to your SDR# folder. Tune to frequency (Make sure this frequency is centered in spectrum display) Use >|< to right of tuning frequency. - Select "Folder select" for file save location. Look at 'Write' (= File Size') in panel to monitor this size. Capture PDUs of interest, Try and get a few. Keep size no bigger than 300MB. If PDUs are sent infrequently, don't create a 300mb file with one event in it. Do not rename file as it is important in proper playback with SDR#. Upload file to online file host. Trimming of IQ recordings is possible using a free audio editor called Audacity. Using SDR# WAVPlayer plug-in It is possible to find events on the timeline. Make note of the times and use below. Drag and Drop the IQ file recorded with "IFRecorder" in to Audacity. You will probably get a warning about import method. Choose "Read the files directly from the original" (faster). The file should load with the correct SampleRate and bit depth. "300000" and "32-bit float"
On the waveform window find the time and highlight with mouse. Click and drag. Have a lead-in and lead-out of about 10 seconds from event. Hi Alessandro, the more IQ samples you can provide the better. Any of the PDUs listed above would be good, but mainly "Protocol:Location_information SubType:Long_location_report"
I think I now have the GPS location and I would like to confirm with you that this is correct. I just don't what to post on here directly so it protects your listening area. Since this forum has no private messaging you could try and send me a PM over at the Radio Reference forum under the same user name. pouvez-vous faire une prise en mains a distance avec teamviewer pour observer le problème en direct ? can you make a remote grip with teamviewer to observe the problem live? Which version. Single SDR#/Dongle or 2 x SDR#/Dongle. TETRA Trunk Tracker follows call to VC carrier then turns up volume. It switches back to CC and lowers volume when call completes. Are you saying, part of call is silenced before end of call? You need to receive "D_SDS_Data" PDUs with "Protocol:Location_information" for this to work. Not always sent out by MS. It would be better if you make a short video and upload it to file hosting site. You can make video with free OBS Studio. Not to hard to setup and use. You can capture desktop, part of desktop or just a window. Use a low framerate when make video like 10fps. Don't make video file size to large. TETRA Demodulator plug-in has been updated by me. "Tweaked Edition (Unofficial) v1.0.0.5"
It's is required for some SDS features to work with TETRA Tunk Tracker v1.0.5. Please read text files in zip for plug-in. FIXED .NET pop-up errors. Should no longer require "TETRA popup error dismisser' is you use it. Interval for displaying output to "Network Info" window. See 'SETUP.TXT' and 'UPDATE.TXT' for more details. Have merged Simple[Single] and Normal[Dual] version in to one. Support for D_SDS_Data long location report. Remote window. (as "On Top") - This shows G/SSI and their labels if exists. Hold delay after recorded calls. Save path for DSDPlus.LRRP. No need to copy LRRP and map data to TTT folder. FIXED: Some D_Setup PDUs don't have a Calling Party SSI included. Calls where not been set-up. It only works with the provided TETRA plug-in supplied in zip. (2018-September-11).